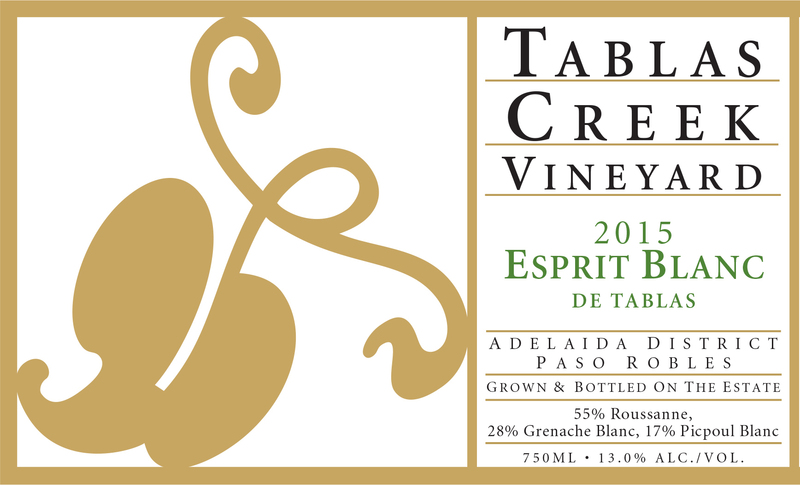 The Tablas Creek Vineyard 2015 Esprit de Tablas Blanc is a blend of three estate-grown varietals, propagated from budwood cuttings from the Château de Beaucastel estate. Roussanne provides the core richness, minerality, and flavors of honey and spice, while Grenache Blanc adds green apple and anise flavors, a lush mouthfeel and bright acids. Picpoul Blanc completes the blend, adding a saline minerality and tropical notes. The 2015 Esprit de Tablas Blanc is powerfully fruity and floral on the nose, with a powerfully exotic nose: ripe melon, honeysuckle, vanilla bean, mace, and a little savory cedar spice. The mouth is rich and characteristically Roussanne, with flavors of baked pear, creme caramel, and baking spices. The acids build on the finish to a mango-like intensity. A fascinating, structured Esprit Blanc that should be a pleasure to watch evolve in bottle. The 2015 vintage saw dramatically reduced yields from the combined effects of four years of drought and cool, unsettled weather during May's flowering. Months alternated between significantly cooler than normal and significantly warmer than normal, which produced an early start to harvest but required multiple passes through most vineyard blocks during a long, drawn-out picking season. Yields were down as much as 50% in early-ripening grapes like Grenache Blanc, but later grapes like Roussanne were only down slightly. The result was a vintage with excellent concentration but unusually good acids, and wines with dramatic perfume, texture, and intensity. We began harvesting our Grenache Blanc on September 11th followed by Roussanne on September 15th, and our Picpoul Blanc on September 16th. Picking continued through September and October, finishing with our last lot of Roussanne on October 28th. The grapes for our Esprit de Tablas Blanc were grown on our certified organic estate vineyard. The fruit was whole cluster pressed, and fermented with native yeasts. The Roussanne was fermented in neutral oak of various sizes: 60-gallon oak barrels, 170-gallon demi-muids, and 1200-gallon foudres. The Grenache Blanc was fermented in stainless steel and also in one foudre, and the Picpoul Blanc was fermented in small neutral oak and stainless steel barrels. All the wines went through malolactic fermentation. The Esprit Blanc was selected from the vintage's best lots, blended, and returned to foudre in April 2016, and aged an additional 8 months in foudre until its bottling in December 2016.